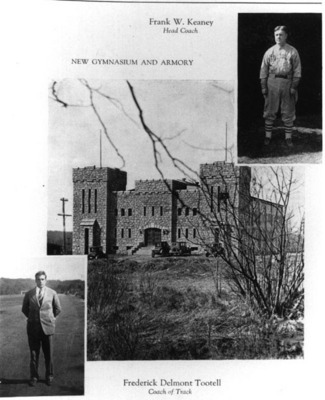 Designed and built in 1928 by Bigelow, Kent, Willard and Company, Rodman Hall first served as an armory and then as a gymnasium. Called Hammond Hall, in honor of Captain Hammond, commandant of the first Reserved Officers Training Corps (ROTC) unit based in the building, Rodman Hall was renamed in 1938 for Thomas Rodman. Hired in 1890, Rodman was a professor of mechanical engineering, physics, and the college’s building superintendent who oversaw much of the campus construction. As a gymnasium, Rodman Hall was home to the Rhode Island Running Rams basketball team and the legendary Coach Frank Keaney. It was here that Keaney developed the fast break that changed the face of basketball. Today Rodman Hall is home to the Graduate School of Library and Information Services and the Community Planning and Landscape Architecture Department.